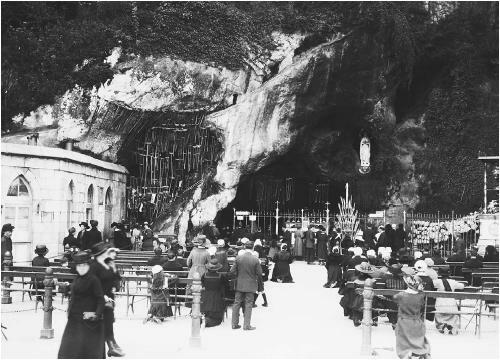 The healing Grotto of Bernadette at Lourdes, France, was constructed on the site where 14-year-old Bernadette Soubrious (1844–1879) claimed to have conversed with Mother Mary in 1858. Since the time that the miracle occurred to the young miller's daughter, pilgrims have journeyed to Lourdes to seek healing from the waters of the natural spring that appeared in the grotto next to the Gave de Pau River. Consistently, for decades, an average of 200,000 people visited the shrine each year. The celebration of the 100th anniversary of Lourdes in 1958 brought more than two million persons into the small community in southern France. In the 1990s, annual attendance rose to more than five million per year. On February 11, 1858, Bernadette Soubrious and her two sisters were gathering firewood outside Lourdes when she fell behind the younger girls. That was the first time that Bernadette saw the apparition of a lady dressed in white with a blue sash and a yellow rose on each foot standing in a grotto next to the river. The lady did not speak, but made the sign of the cross before she disappeared. Bernadette returned to the grotto a second time, but it was not until the lady's third appearance that she spoke and asked Bernadette if she would like to meet her every day for two weeks. Bernadette enthusiastically agreed, and word of her visitations soon spread throughout the entire village. Crowds gathered to observe the girl and hear what messages she would relay from the lady. The apparition insisted again and again that priests must build a chapel in the grotto and that Bernadette was to drink from the spring there. Since there was no spring in sight, Bernadette began to scrape at the muddy ground until a spring bubbled forth with waters that were immediately believed to contain curative powers. Water from that same spring is still piped to a bathing house where pilgrims gather to receive its healing blessings. Upset by the disturbances that she was causing in the town, the local police and civil authorities interrogated Bernadette, but they could not dissuade her from continuing her meetings by the grotto. The local parish priest, Father Peyramale, also did his best to convince Bernadette that she was only imagining the visions. Then, on March 25, after her sixteenth visit, the lady revealed her name to Bernadette, who, when questioned by the skeptical priest, relayed the lady's identity as "The Immaculate Conception." Because that title had been applied to Mother Mary by Catholic theologians only four years before and was only known to the clergy, Father Peyramale thought it highly unlikely that a teenaged girl who could not read or write and spoke only a crude, provincial form of French would know the phrase used to define the doctrine that declared Mary free from the taint of original sin. With the official endorsement of the clergy, the grotto at the edge of the river would soon support a healing chapel and begin to attract pilgrims from great distances. After 1866, when a railway line was completed to Lourdes, many thousands of those afflicted with various illnesses began to arrive in the little French town. In that same year, 22-year-old Bernadette Soubrious left for a convent in Nevers, hundreds of miles to the north. She died there in 1879. Since the 1860s, thousands of pilgrims have left their crutches and canes at the shrine. Thousands more claim to have been cured of advanced cancers. On May 3, 1948, the Bishop of Nice acted at the request of the Lourdes Medical Commission and declared Rose Martin's healing to be a miraculous cure. When Rose Martin arrived at Lourdes in 1947, her total weight was a scant 70 pounds. She had undergone surgery for cancer of the uterus in February 1947, and the cancer had continued to spread despite several subsequent operations. Doctors could prescribe only morphine to enable the suffering woman to endure the pain of her affliction. On July 3, 1947, after three baths in the waters of the shrine, Rose Martin returned to her hotel. Her appetite had suddenly returned. The awful pain had disappeared. Several of her medical complications had vanished. In 1948, Madame Martin was examined by the medical bureau at Lourdes and declared to be totally free of cancer. In the interim she had gained 34 pounds. She had become the picture of health and vitality. More than 20 leading French doctors and surgeons confirmed the unusual healing. Annual checkups and subsequent physical examinations revealed that she remained free of the disease. Dr. Alexis Carrel (1873–1944), an American surgeon who won the Nobel Prize in 1912 in physiology and medicine for his extensive work in suturing blood vessels, transplanting organs, and inventing the mechanical heart, witnessed a miracle healing firsthand when he visited Lourdes in the 1940s. Only an hour before a young woman named Marie Bailly had been carried to the waters of Lourdes, Carrel had examined her and saw that she was dying of tuberculosis, a disease that had afflicted her for years. As he observed her, Carrel saw her pain-wracked body suddenly surge forward as if filled with a powerful force. Her paleness was replaced with a rosy hue, and as the surgeon and his colleagues watched in astonishment, they saw her swollen abdomen transformed from a misshapen lump and flattened to a smooth stomach. Her pulse calmed, her respiration returned to normal, and she asked for the first food she had been able to consume in almost a week. Marie Bailly was found to be cured of her terminal illness. The affliction must be a serious disease. If it is not classified as incurable, it must be diagnosed as extremely difficult to cure. There must be no improvement in the patient's condition prior to the visit to the Lourdes shrine. Medication that may have been used must have been judged ineffective. The cure must be totally complete. The cure must be unquestionably definitive and free of all doubt. Such stringent requirements set by members of the medical profession in order to qualify as a miraculous healing do little to deter the five million visitors each year who travel to the small town in the foothills of the Pyrenees in search of their own miracle. Carrel, Alexis. Voyage to Lourdes. New York: Harper & Brothers, 1950. Cranston, Ruth. The Miracle of Lourdes. New York: McGraw-Hill, 1955. Harpur, James. The Atlas of Sacred Places. Old Say-brook, Conn.: Konecky & Konecky, 1994. Lourdes, France. 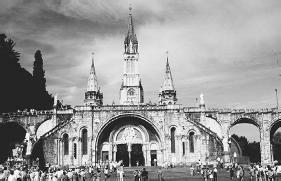 [Online] http://www.lourdes-france.com/bonjour.htm. 2 May 2002. Our Lady of Lourdes. [Online] http://www.catholic.org/mary/lourdes1.html. 2 May 2002.